LAS VEGAS —There was a time when the TDK was known best for manufacturing high-quality blank cassette tapes. Imation capitalized on that brand recognition and licensed the TDK Life on Record brand to build portable speakers, headphones, and earbuds. At CES, Imation is showing the latest entry its collection: the weatherized Trek Flex. This shock- and water-resistant, portable, self-powered Bluetooth speaker is outfitted with two full-range drivers and a passive radiator, and its uses the Waves MaxxBass virtual subwoofer technology to deliver deep bass response that defies its small size. Track controls on the speaker let you move through your playlist directly from the speaker, which you can also use as a speakerphone. 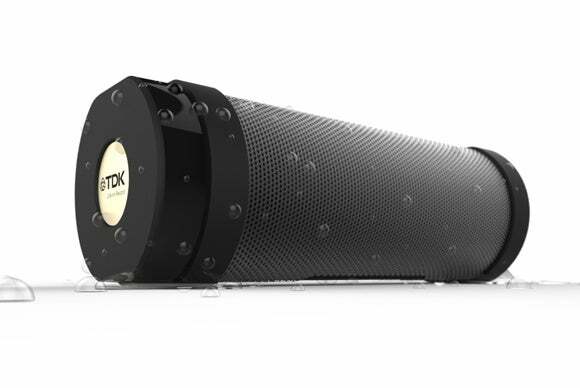 Imation says the Trek Flex’s cylindrical shape helps it radiate sound throughout a room, although I imagine most people would buy this battery-operated speaker for outdoor use: It boasts an IP65 rating, which means it’s completely protected from dust ingress and low-pressure water jets from any direction. The story behind the story: You can’t whip out your smartphone in a Best Buy without knocking over three Bluetooth speakers these days, so anything new really needs a unique feature to stand out. The Trek Flex accomplishes that with its unique industrial design and weatherized enclosure. But all that will be for naught if it doesn’t knock you out with its sound quality. And for that, we’ll have to wait until we can get a review unit. TDK expects to price the Trek Flex at $130 when it ships sometime in the first quarter of 2015.